February 14 is well-known as Valentine’s Day, but now T-Mobile is making February 13 a holiday, too. 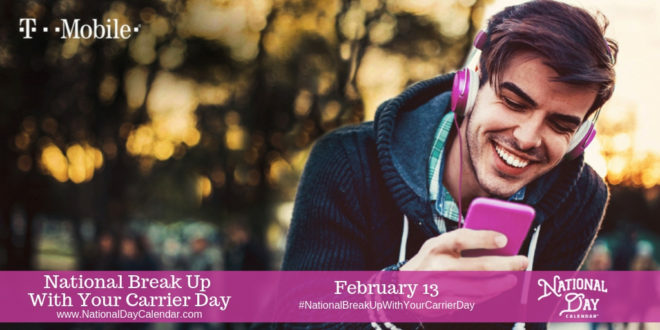 T-Mobile is teaming up with National Day Calendar to make February 13 into National Break Up with Your Carrier Day. As part of the holiday, T-Mobile is rolling out a new deal that offers two lines of T-Mobile Essentials and two phones for $100 per month. With this deal, customers who switch to T-Mobile can get two lines of the T-Mobile Essentials plan plus two phones for $100 per month plus taxes and fees. Customers must enroll in autopay, and the cost of the phones will be spread out of 24 monthly credits. The phones available with this deal include the T-Mobile REVVL, the REVVL Plus, the REVVL 2, the LG Aristo, the LG Aristo 2 Plus, the LG K20 Plus, the Samsung Galaxy J3 Prime, the Samsung Galaxy J3 Star, and the Motorola Moto E5 Play. Customers can also get two lines of T-Mobile One plus two phones for $130 per month. T-Mobile is adding new devices to its #GetOutoftheRed offer on February 13 as well. The new phones being added include the Samsung Galaxy Note 8, Samsung Galaxy S9 and S9+, Google Pixel 3 and Pixel 3 XL, and Apple iPhone XS, XS Max, and XR. With the #GetOutoftheRed promotion, Verizon customers with an eligible device can switch to T-Mobile and get the remainder of their device payments paid off up to $650 in the form of a virtual prepaid MasterCard card. They can then bring that device over and use it on the T-Mobile network. They’re running a 4 for $160 promo on Essentials including an iPhone. I’d rather have a less expensive phone and be on a ONE plan, but everyone is different. Where does it state iPhone XR, XS and XS Max are included in #GetOutoftheRed? Missed that “on February 13” I guess because the T-Mobile release specifically mentions the S9, etc. but not Apple. Any idea how long the #GetOutoftheRed offer will last going forward? It’s been around a while now. Regular price for Essentials is 2 lines for $90. They should be advertising the hell out of that price point. I’m still on the 2 lines for $100 plan and not leaving it anytime soon. I’ve got 4 for $100 too…but pretty much $130 after taxes and fees. Can’t beat the un-throttled video. I did have 3 lines from that free line awhile back but ended up dumping it in a Google FI test. Again, no love for existing customers. still keeping my 2/6GB/$70 deal and with the free 3rd line I have, i’m paying $118 which includes my S9. As much as I want unlimited, I’m keeping my plan. eh, not really that much cheaper than the 2 tmobile one lines for 100 + 20% + free line + kickback + one plus that you could have switched to a while back, especially when factoring tax, unlimited and one plus international speeds. hmm, not really the best deal. I have 3 One lines (all unlimited) for $90 including a free line and after discounts -autopay, kickback on 2 of 3 lines, all taxes included-. forgot to add, we also have the free upgrade to One+ for 5 years. Unfortunately if I switch to one I lose that free line and thus I get bumped to a higher. Yes I know there are cheaper out there that some people have but if I were to make a switch I would be paying much higher. I pay $82 right now for the three lines with all the taxes. Two of the lines barely ever go over 2 gigabytes and my line is the only one that flirts with six or slightly higher. But I still have 15 GB on that rollover promo so I’m okay. I would love to switch to one but I am not going to be paying $120 for it plus the cost of my phone. So I’m just waiting for a new promo that makes sense. If it came to 4 lines for $100 I would switch in a heartbeat. I even considered the promo that they had during Christmas or Black Friday but I would still be paying $30 more. so I wait and wait some more. You could have gotten a killer deal switching to ONE including taxes when they launched it. I ended up with 5 voice lines and 2 tablets for $150 out the door. When it launched, I was already on the 2/6GB/$70. I went with cheap. Taxes moved the needle up to about $80. i’ll wait for a good deal. i’m ok with my plan. Even factoring the Netflix bit, we are still ahead. My employer offers a 22% discount on all VZ plans. I haven’t switched yet, but who knows? With the discount, I wouldn’t mind jumping ship at all. With all these TMO promos geared toward “new” customers, I could switch to VZ and then jump back to TMO (to take advantage of their promos) after 2 yrs. It’s no sweat, really. how’s the view from the back? So what you’re saying is you’ll probably save the taxes and fees and be no further ahead than if you stayed with T-Mobile? How long have you been with T-Mobile, because my guess is you’re getting better promotions than what they offer now. I’m what’s called a “legacy customer”. I have a Simple Choice plan. Been with TMO for over 5 years. I want to switch to the One plan. TMO routinely offers the $35/line for 4 lines. But I can’t take advantage of that since it is for new customers only. I’m working for a company now that offers 22% off with VZ. This puts VZ on part with TMO pricewise. VZ also has better coverage. So when VZ has a promo that I like, I’ll jump ship. I gave up 5 voice lines and 2 tablets at $150 out the door to switch. Got 3 for $120 when I came back. The pastures were NOT greener at AT&T for me. Verizon doesn’t offer employer discounts on their unlimited plans. You’ll only be eligible for a discount on plans with data allowance or shared data plans.. The only discount Verizon gives on unlimited is if you’re in the military or a veteran. So, quit complaining and leave. Otherwise, you’re happy. Then T-Mobile should spread coverage in the Southeastern part of the US. T-Mobile has done little to nothing in rural areas of MS, AL, GA, LA, and FL. T-Mobile continues to be a metropolitan wireless carrier. That’s why I hold onto Verizon. Florida is a powerhouse for T-Mobile and it’s getting better. Places in the panhandle where I had no coverage just a year and a half ago have full signal, even in the middle of nowhere. Living in the panhandle, I am happy to see the improvements. However, even with those improvements, my short drive from Tallahassee to Panama City on Hwy 20 still sees no signal for a good 20 minute stretch, at least. After that, it’s flaky. I assume these payoff deals don’t work with an Apple Watch?